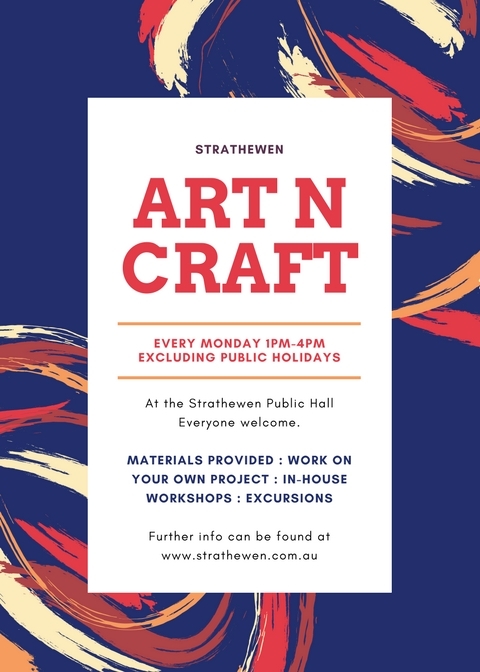 Starting from February 5th 2018, the Art & Craft Social Group will meet every Monday from 1pm until 4pm Strathewen Public Hall. You don’t need to be an artist or an expert in craft to attend. The group is open to everyone young and old, crafty and non-crafty, professional and amateurs alike. You can join in on a project that the rest of the group are working on or you can do something on your own. It’s up to you. Most materials are supplied thanks to the Bushfire Relief Trust. From time to tine the Art & Craft Group run various in-house workshops in the Art Room – you can check out their upcoming workshop schedule here. The Art & Craft Social Group also host art based excursions. The excursions are held at various days and times of the week and are advertised via the Strathewen Connect Communications List and the Strathewen Connect Facebook page. All residents are encouraged to sign up to the Communications List to be notified of these wonderful free of charge activities.